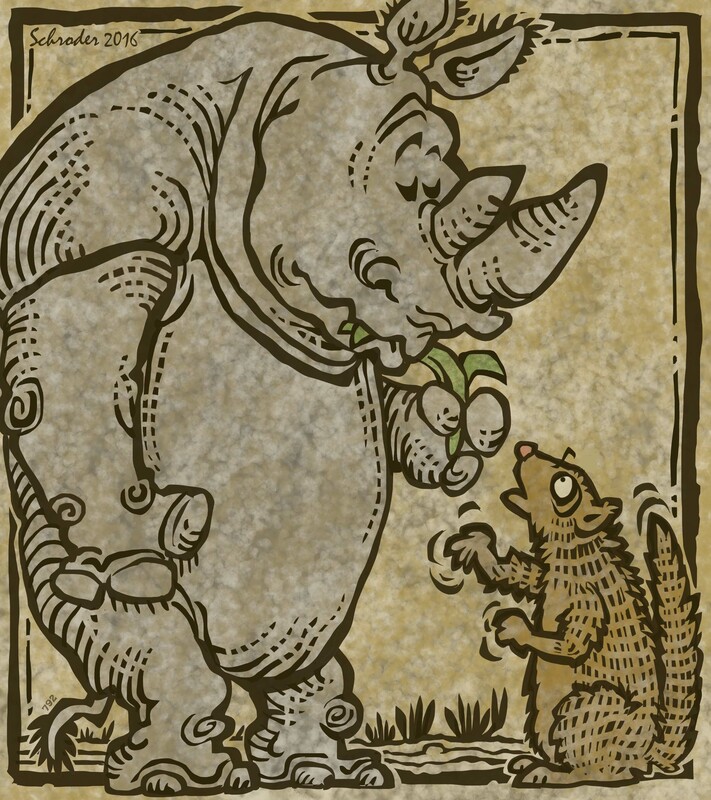 Rhinos simply do not speak Mongoose, try as We may. Lesson: We can’t have it all. Love this style, Bill! Wonderful!! Can’t fathom how this (wood block-style) gets done on computer. For that matter, can’t fathom how any of your amazing work gets done on computer! Can’t have it all! Loved Feast Day, St Francis of Assisi, too, if you’re keeping track…! The woodcut look is made by removing the positive space from the dark, basically erasing (or cutting away) the lighter areas, revealing the pale under-layer, which I then texture and tint. The idea is much the way one would make a real woodcut. It does have one marked advantage; it’s easier to fix it when you slip. Or enhance after the fact. I love hearing from you. It makes my day.